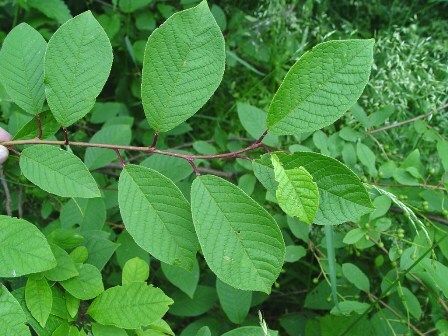 Other names: European bird cherry, hackberry. Bird cherry is a fruit from northern Europe. 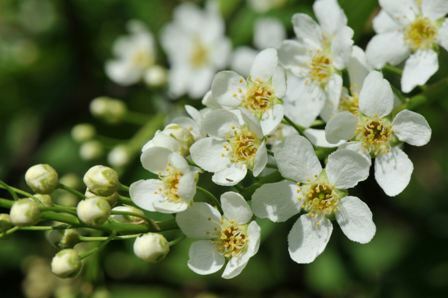 It has a long blooming period and the flowers are very attractive and fragrant. So it is grown more for landscaping purposes. The fruits are bitter sweet in taste. These are not eaten fresh, but used for making a liquor, particularly in Scandinavia. A large shrub or tree, upto 2-12 m.
Leaves alternate on the annual shoots, pedicellate, entire, almost hairless on both sides, sometimes brown-hairy beneath; lamina 5–10 cm (2–4 in. ), elliptic, taper-pointed, margins fine-toothed; autumn colour various shades of pale yellow and red, comes early. Buds, narrowly egg-shaped, long, sharp-pointed, brown. Scale edges usually lighter than rest of the scale. Flowers regular (actinomorphic), fairly small, heavy-scented; calyx 5-lobed, short, triangular; petals 5, white, rarely reddish; one carpel; stamens more than 20; inflorescence a many-flowered, pendent raceme. Fruit a small drupe, shiny black. 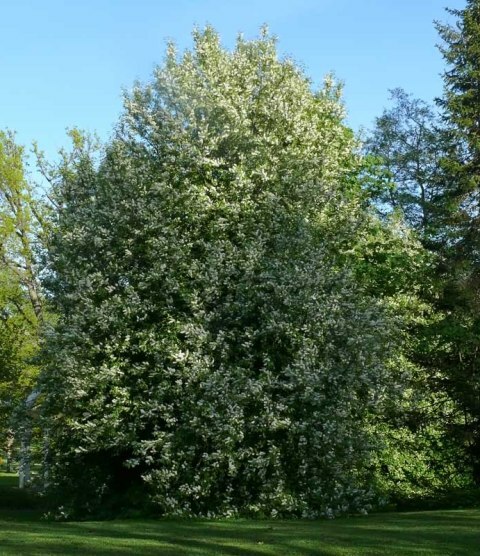 Most bird cherry trees grow wild but still some trees are planted for landscaping. It is a quite demanding tree as regards the growing substrate. It can thrive in shade too but in scarce light, the number of flowers produced is reduced. New plants can be raised from seed which requires 2-3 months’ cold stratification before sowing for proper germination. 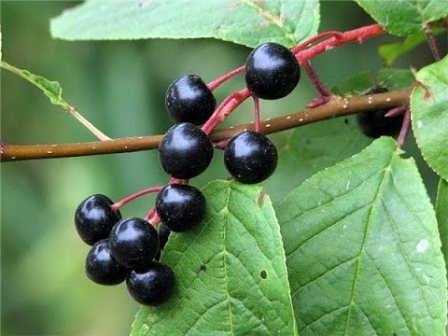 The black fruits of the bird cherry are bitter-sweet in sweet. So these are not palatable for eating out of hand. However, in Scandinavia, these are used for making a tasty liqueur. The fruits yield a pale lilac dye which is used for dying wool.